WhiteSmoke, Inc. - Wilmington, DE. March 31, 2009 - WhiteSmoke announces the immediate release of a major update to the server-side component of its English writing software, the result of 8 months of intensive development, the analysis of millions of sentences, and extensive customer surveys. A client update for download onto the user’s PC will be launched in the following days. 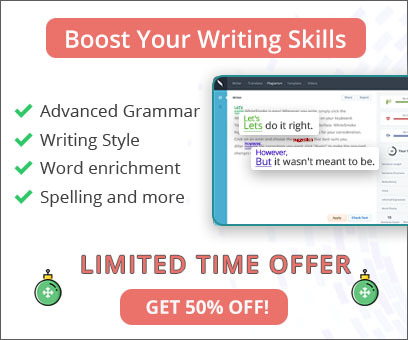 Changes include a new version of the contextual spelling algorithms, a greatly expanded dictionary-thesaurus module, and updates to the grammar checking engine. The major feature of this update is the new version of the contextual spell checker. Greatly expanded in accuracy and scope, the detection and correction of contextual spelling errors now extends to thousands of word pairs based on statistical data of common errors made by native and non-native speakers. Such errors (e.g., “pear” instead of “pair”;”they’re” instead of “their”) are often missed even at the proofreading stage, so an algorithmic solution such as WhiteSmoke’s is a boon to writers of all skill levels. Additional changes have been made to the grammar engine of WhiteSmoke. The detection and correction of missing subjects in sentences has undergone a major update, with subjects being inserted into sentences in contexts where it could improve the intelligibility of the writing. New punctuation errors are now corrected after refinements to the punctuation algorithms. Detection of mismatched verbs when they apply to the same subject has also been improved, with increased accuracy of corrections and reduced false positives. 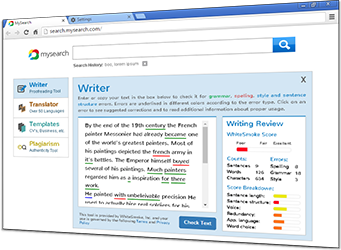 WhiteSmoke’s grammar checker and other features work equally well for ESL speakers and native English speakers. The dictionary-thesaurus module has also been updated. The server has been optimized for faster return of dictionary queries, and the dictionary database has been extended with tens of thousands of new and updated words and definitions.